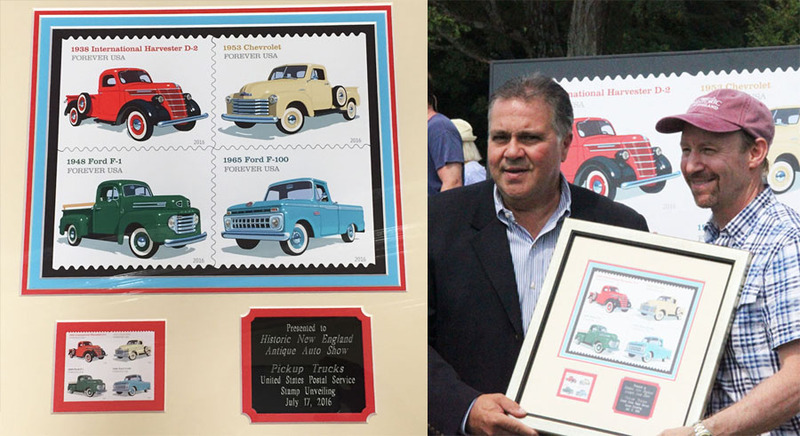 Postmaster Nicolas Francescucci was on hand at the Codman Estate Antique Auto and Classic Car Show in Lincoln, Massachusetts, on July 17 to unveil a new group of stamps commemorating vintage pickup trucks. Each of the four stamps in the Pickup Trucks series features a 1938 International Harvester D-2, 1948 Ford F-1, 1953 Chevrolet, and 1965 Ford F-100. Francescucci said a few words about the stamps and posed for pictures with Historic New England staff member Peter Gittleman. More than 1,300 people attended the show. They enjoyed viewing hundreds of classic and antique cars, trucks, motorcycles, and fire engines and talking to the vehicle owners. Don’t miss Historic New England’s next antique auto show at Phillips House in Salem, Massachusetts, on August 14.